I’ve been in a funny gray mood lately. It’s not anything you would notice if you saw me; it’s just an increase in the underlying noise or static – one of those little funks that everyone seems to have now and then. For the most part I feel great – my daily mood is happy and forward-looking. This grayness really only strikes me when I’m by myself and undistracted by some pursuit or another. Maybe it’s a seasonal biochemical change or just some issue or combination of issues with which I’m not satisfied. I’m a very optimistic person, and I really believe in the effect that forcing a smile and positive thinking can have in making me feel good about myself and the world around me. It’s really been an odd week; between feeling down and trying to make myself feel up I’ve been having these odd jumps between elation – real, true joy – and meh-ness. I went for a bicycle ride after work yesterday because I find that physical exercise is a good way to get the endorphins going and to clear my mind. 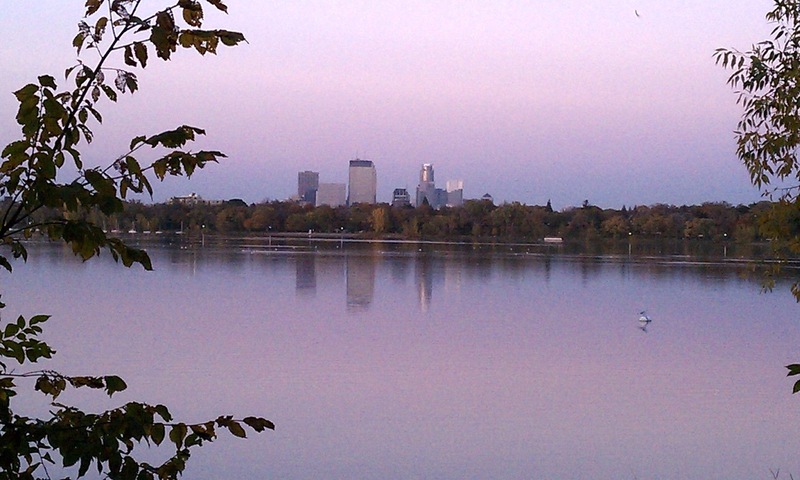 I went biking around Lake Calhoun and was once again amazed that I live in such a beautiful area of town. I live less than a mile away from this gorgeous lake that offers bike and walking trails and canoe/kayak/paddleboat rentals. Awesome! My view of the downtown Minneapolis skyline from Lake Calhoun at dusk last night. I wasn’t as enamored of Minneapolis when I first saw it as I am now. First, I remember being shocked that downtown Minneapolis and downtown St. Paul were about 10 miles away from each other. I was bummed out because I had this image in my head of one large metro area, not two smaller cities with a bunch of residential and suburb-like areas between the two. Second, I was taken aback by how small Minneapolis was. I grew up near Chicago; you could see the city from all the way out in Tinley Park – the suburb in which I grew up – and that was 30 miles away from downtown! 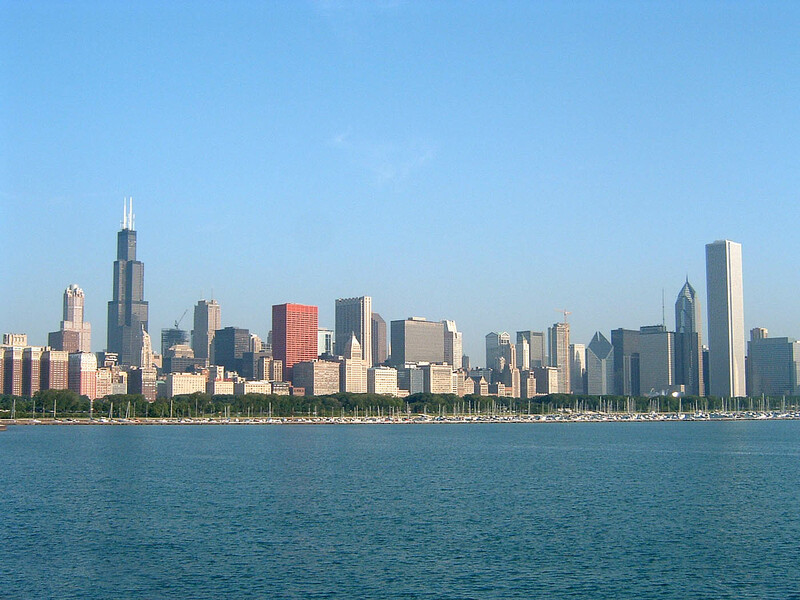 When I was little and we drove on the highway toward Chicago, I would watch from the backseat as the skyline would grow to fill more and more of the windshield until we arrived in the city and I had to start craning my neck up to see the tops of the buildings. I was reminded again of how small Minneapolis is when I visited New York City. When we got off the plane at JFK I was struck by how buildings filled the horizon. I didn’t just have to crane my neck up in NYC, I had to crane my head from left-to-right just to see the entire skyline. From a distance I can stretch out my arm, hold my thumb up and close one eye to “hide” Minneapolis. In Chicago, I have to hold up both hands, and in New York I couldn’t hide the skyline at all. But being in a smaller urban city definitely has its advantages: Rent is affordable – even right downtown, parking is reasonable, and traffic is tame. Most events and festivals aren’t exorbitantly priced or over-crowded. It’s pretty easy to get involved in community planning and local politics. I have the culture and variety that inevitably pops up when you cram a lot of very different people together in a small space. If I want to get away to the country all I have to do is drive 20 miles in any direction and I’m in prime motorcyle riding land, pumpkin patches, state parks, etc. There’s a lot to love in Minneapolis. At least for another month or so until the blizzards start. I found this photo at Nokohaha – it looks like an awesome Minneapolis blog with a lot of other Minneapolis sites in it’s blogroll! I didn’t know you grew up near Chicago! My dad still lives in Palatine, and I went to high school in Mt Prospect. 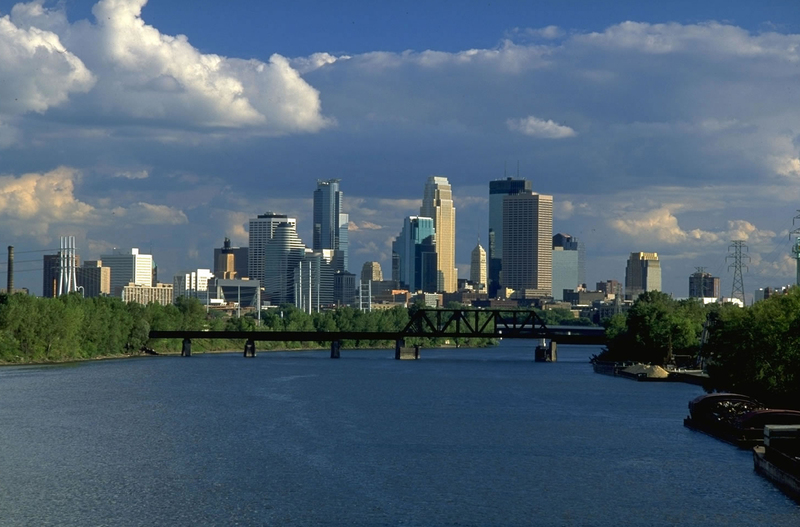 Anyway, never been to Minneapolis but it looks nice and how cool you’ve got that lake so close to you. How your mey-ness mood passes soon.